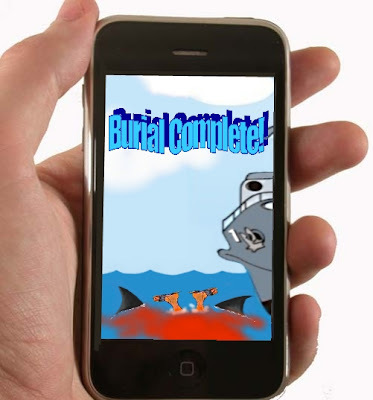 An obviously hastily produced download for mobile phones, this app allows you to bury Osama Bin Laden in a variety of interesting ways. It's just possible that Kharma had this application in production waiting for the inevitable(?) day when Bin Laden was killed by US forces. However, the graphics and production are simply woeful - design may have began about 7 hours ago. If you think you might gain satisfaction from lowering the corpse of the recently deceased terrorist leader into a shark infested ocean or burying him in a rat infested cavern - then this 'thing' is for you.